You have 901 ideas for your business (or worse, you have more than one business). Once you begin one thing, you start another, and another. But what if I told you that’s what’s keeping you from hitting your goals? What if your inability to pick just ONE thing is the reason you can’t reach that next-level success? I know it’s hard to hear. I know, because I’m telling my own story. In this episode, I’m talking about the one-pointed focus that completely altered my business and helped grow my agency by millions of dollars… just this year! Tune into this episode for “how to’s” and the story about how FOCUS changed my own business this year… just in time for planning your ONE big idea for 2019. [10:20] Think you’re not doing enough to see success? You might be doing too much. 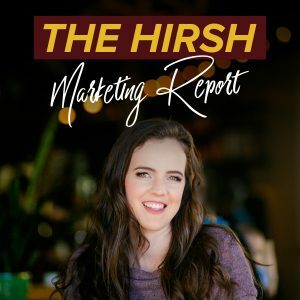 In today’s episode, I’d like to talk about how important focus in your marketing is, and I’m super passionate about this topic because I’ve learned this the hard way. I know several, several 7 and 8-figure business owners who have also learned this the hard way. And it’s honestly not just focus in your marketing, but focus in your business is truly, if you asked me, the one key to having success. This could be the one thing because, way too often, do us visionary entrepreneurs have a ton of ideas, and we build out a funnel or have a marketing plan or even have a product that we want to offer, and we do it, and we launch it, and it goes well, and then we think we’ve mastered it…and then we move onto something else, and/or the extreme is having multiple businesses. I’m in the Inner Circle with Russell Brunson, and if you ask most people in there, they come in with 5, 6 businesses that they have, and then they end up with 1 after a couple of years or a year in the Inner Circle, and I was the same way. I had, when I started, when I started Inner Circle just over a year ago, I had my agency, I had my Virtual Assistant Academy that I was still selling, and then I had Funnel Besties. My friend, Lindsay and I did a membership site called Funnel Playground. And within the last 6 months, I first shut down the Funnel Playground membership site that was profiting. It was $100,000 a year business, but it was taking away so much focus from my agency that I knew I was losing money. And then in the last 5 months, I’ve shut down my Virtual Assistant Academy, which was a big deal, and that was a side passion project, and since I’ve done that, my agency has grown so much, but it’s also felt so much better to put all my focus into that. I want to tie this into marketing because I think this is so important. When you build out a funnel or a value ladder … Let’s say you have a value ladder of all the products and things that you’re going to offer your customers. And sometimes people’s value ladder is 3 things, sometimes it’s 6 things, but the key with it is it’s all attracting the same avatar or the same ideal customer or client, and if it’s attracting the same person, then that’s fine. You can have multiple products, but the key is that it has to be where you are building a brand, and you are building a message that is in alignment with everything that you offer. And that’s where a lot of people have disconnect, and that’s where I had disconnect because it was like my Virtual Assistant Academy and marketing: that was a different avatar than somebody who wanted done-for-you Facebook ads. And so it was really hard to put my focus in both of those things and create content for both of those avatars and then see success with both of them. Build out your value ladder, and the key is that each step in your value ladder should support the previous step and the step ahead. For us, my value ladder is pretty basic right now. I have several opt-ins that are free funnels that people can go through. I have two $27 small products that we’ve attached to some of those funnels, which I honestly don’t really push really heavily. I maybe will again, but, again, I’m super focused on my client side of things right now. And then I do have a course, a Facebook ad course, that’s 697, and that course goes perfectly into our done-for-you services, and my done-for-you services are definitely my focus. But what’s happened is people come in, they take my course, they buy my course, and this has happened in several occasions, they start taking it, and going through it, and then they email us, and they’re like, “You know what? We love this content, but we do not want to learn how to do this ourselves. Can we just hire your team?” And we’ve built it so inside of the course, and I don’t even promote this course very much. That’s maybe a project for 2019, but it is available on my website to buy. Inside of that course, we upsell. We sell people and we tell people they can book in a call with our team, so that really compliments it because it’s maybe someone at a beginner, more earlier level might be interested in that course, but then once they … Nobody really should be running their Facebook ads forever. No one should. Once they’re at the level, they can come and work with us for our done-for-you services. Obviously, not 100% of people will do that, but a small percentage of people will. We know it’s working because it’s happened before. That’s an example of something that’s working in a value ladder because the key is you’re helping people get micro-success, and then when they do that, they’re building trust with you and they’re buying more things. So build out your value ladder, and that might take you a while to build it out. You might only have two things on it right now. Build that out over time, and then you have that, and then the key is, again, it has to attract the same person. And then the only place you can ever add new things, and this is a hard rule to go by: is in the front end, a new, free offering that’s getting new people into the world, but it’s still sending them to the same product or the same service. The best place to put that energy of ‘I need to be creating new things’ or ‘I want to be creating new things,’ is in the front end and how are you going to drive traffic into your business, into your world and your marketing. And my suggestion is that you don’t do more new things than once a quarter, and that’s hard. That’s a rule that I have for myself is we can’t launch big new funnels or projects that are happening more than one a quarter. The real key with this is the reality is the amount of work that goes into building out a good funnel and marketing campaign is at least a 3 project because you have the initial part that you have to build it all out and the copy and the design and the strategy and the overseeing of it. It’s a lot of work, and then you have the ads side and driving traffic, and then you have taking that data and making it better and better and optimizing it and optimizing the funnel, and then you scale it. If you were doing one of those every month and constant new things, then you would basically be halfway doing something and then just restarting over, which means you’re three steps forward and two steps back, three steps forward, two steps back; and the power in focusing and perfecting what you have is so valuable and a discipline that’s hard for some. Every time I think of a new idea, sometimes I run it by my coach, Alex Charfen, and to be honest, you guys, I just actually was like, “I’m gonna launch, relaunch my Facebook ads course, and redo the webinar, and it’s in alignment with my ideal customer, and it’s on my value ladder. I’m gonna relaunch it. I’m gonna do a whole new funnel, a new webinar, update the course,” all these things. And I was like, “That’s gonna be our quarter …” I wanted it to be our quarter 4 goal, “and we’re gonna do it in January,” and when I sat down and started going through it, and I did run this by my coach, I was like, “This is not where I should be putting my energy.” Even there: it is a part of my value ladder, but have I mastered and fully leveraged the marketing I could do to get done-for-you clients? No. We depend so much on referrals that I actually don’t have a huge marketing plan on the front end of our agency, and so instead of implementing that, and I even took the time to build out the plan, I had the dates on there, and then once I realized, wow, the benefit of me putting my energy into creating this new marketing plan that we created, which maybe I’ll do another podcast episode on, but we created an awesome marketing plan for the agency, and I immediately switched gears and started working 100% on that. Right now, it’s a 3-phase marketing plan. Actually, it’s 7 phases, but there are specifically 3 phases for Facebook ads. That’s 3 levels of videos that we’re building out, and I’ve recorded 2 of the levels, but, right now, pretty much all of my focus and attention goes into that marketing plan. And there’s a ton of video recording that has to happen, both for the front-end Facebook ad marketing, but also for our Dream 100. We are launching this Dream 100 campaign, and if you’re not familiar with Dream 100, it’s basically where … I don’t want to go off on a tangent on this, but where you find your 100 ideal clients or affiliates and you send them these gifts, and so, for me, I’m recording a video for every one of our Dream 100 people. So it’s a lot of work, and so all my spare effort and time, which is not a ton of it, but I try and put as much as I can into content creation is going into that. And the power of that means I can do this and I can scale this marketing in the agency and our clients on such a large level that I wouldn’t be able to do if I was splitting my attention even just on the webinar funnel versus agency. Every time I come up with a new idea or I have this, “Oh, man, I’m not doing enough …” How many of you guys, and I’m sure so many feel like this of “I’m not doing enough,” or “I need to do more,” or you’re bored, I don’t even know what it is that inspires, but it’s in us that we constantly feel like we’re not doing enough. We need to have more projects and things that we’re working on, and that might be true and it feels good to get those projects done. [But] I ask myself every single time, “Is this taking away my focus from the most important thing, which is scaling what’s working for us now?” My focus is 100%, for the last 5 months since I made the decision to shut down my other program, been on growing my agency, perfecting my agency, and growing the number of clients that we have, and we’ve gone from 40 active clients to 60 active clients in that time, and taking on bigger client accounts. My team has gone from 10 people to 20 people in that time, and we’re able to serve them at a better level because I’ve put in so much attention. Honestly, not even in just your marketing, but in your business, in general, but it all comes out to the marketing. Everybody wants to launch a new program or a new membership site or a new strategy or a new whatever, and really ask yourself and question that. Is that the right decision? Have you fully maximized and utilized what you have now? And [are you] perfecting it? Because there’s a lot of work that goes into that. We work with a very high profile client, and I want to use them as an example because they do this well. [And they do it to] where it’s like sometimes you’re like, “Man, this is just taking forever for this project to get done,” but they are very strategic with the way they spread out their team’s resources and also very realistic. They don’t just rush in like, “I’m doing a webinar next week.” They never would do that, ever, ever. “I’m doing a webinar next week, or we’re launching the course next month, and we don’t have any of the landing pages or the emails or anything.” Literally, when they launch … First of all, I’m not going to say names on this because I don’t know if I’m allowed to, but you might be able to figure out by my description. First of all, we re-strategized a launch for them almost a year ago of restructuring this program and the way we were going to launch it and taking [the offer] off being able to buy it at any time and doing a live launch and a webinar. And we restructured it, and it’s been almost a year since I started working with this client, and I had that strategy call with them, and we started putting it into place. And we knew at the time that it wasn’t going to be the focus because they had another launch coming up in the spring. That was the focus. After the spring, we shifted gears and we started focusing on this, and since then, the launch planning was 3 months of serious work from not only our team, but their team, emails, copywriters, designers, landing pages, and they just did multi-multi-million dollar launch. It’s still going on. That’s the power behind focus and intention and putting 150% of not only yours, but your team’s effort into one thing is so powerful. And if you look around at people who have created multi-million dollar businesses, they are doing that, and the ones who aren’t constantly have new ideas. I was just at Inner Circle, and there was a presenter – Inner Circle with Russell Brunson [where] we go up for 30 minutes, and we present. And there was a presenter, amazing individual, has a business, and she went up, and I know her, and I know she struggles with this, and she has many ideas and just is an amazing visionary, but then she starts things and then she changes. 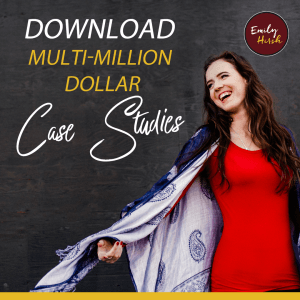 And she went up and shared with us her projects and her ideas, and it was literally like taking her company that just did $2 million in the last 6 months and changing so much about it and adding all these offerings and going from physical product to digital product… And many people were like, “Whoa, no.” But it’s just an example that if you’re so close to it, you don’t even realize you’re doing that, and so just be conscious and aware of that because it is so powerful when you focus and when you scale. And when you put, like I said, not just 150% of your effort and energy into something, but your entire team and your entire company moving towards the same goal and the same plan, and putting from marketing to delivery resources into that. You will grow so fast, and that is a huge contributing factor to my growth, but I’ve also seen it happen dozens of times in other companies that I’m friends with the CEOs. If you guys want help and support with your ads, with your funnels, with your marketing strategy, and you need that real, serious, laser-focused attention, and to really just blow it up, go to helpmystrategy.com and book in a call with my team. We are capping out how many clients we take through this year at 75 clients, and we only have a few more spots left, so don’t wait if you have a launch even in early of next year coming up. Make sure you get on our roster because I am capping it because of how high level we work with clients now. Thanks so much for listening today, guys.